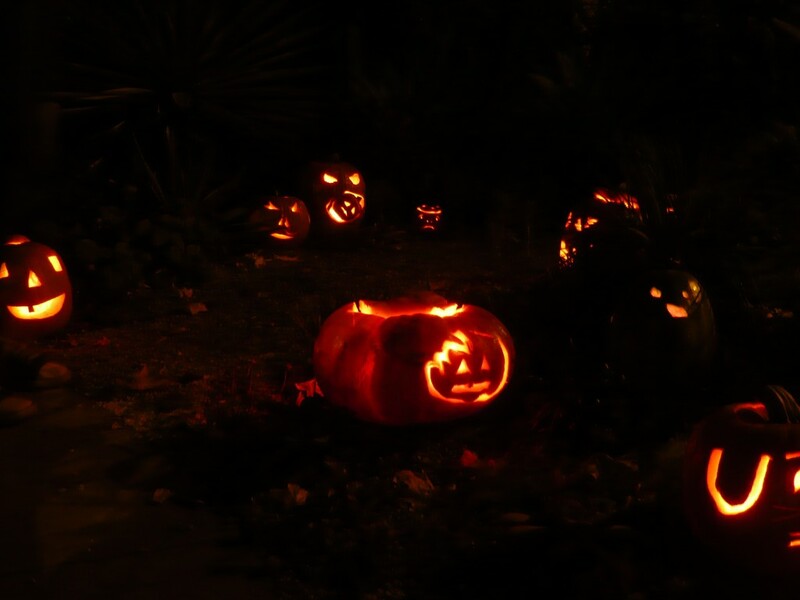 The Germinatrix » Blog Archive » A Garden Full of Pumpkins! A Garden Full of Pumpkins! 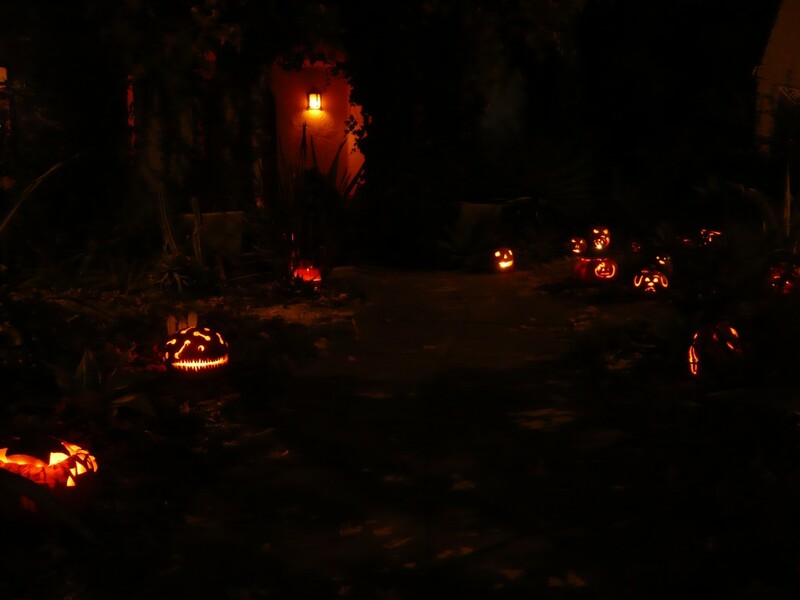 is anything better than a front yard garden all aglow with Halloween spirit? Every year, one or two days before Halloween, I invite a few of my friends over and we have a session of extreme pumpkin debauchery. 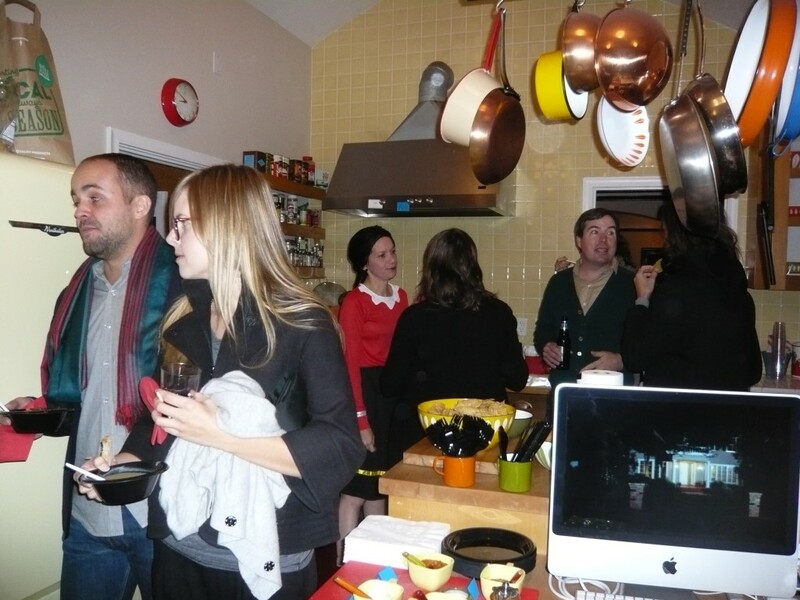 It is my FAVORITE party of the year, and last Friday’s was a particularly fun bash. Fire, knives, and tequila – what could be better? 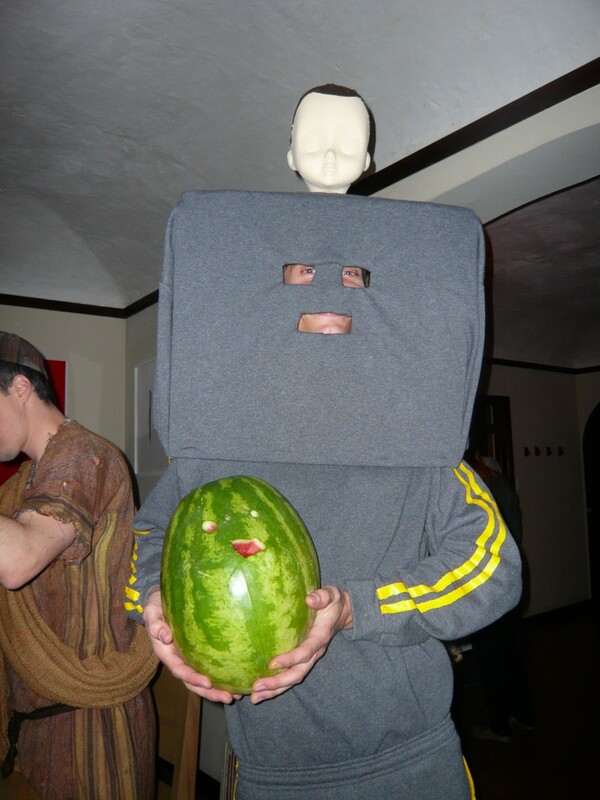 who doesn't want an excuse to stab a gourd while costumed? I secure the devotion of my carvers by plying them with food and drink – two yummy soups were served; one a hearty and spicy Mexican hominy stew called Pozole, and the other a Marcella Hazan recipe from Essentials of Classic Italian Cooking – Potato Soup with Smothered Onions. I was proud of myself – both were really delicious and there were no leftovers, even though I made enough for an army of zombies! I wanted to get everyone in the mood for play right away, so the minute anyone walked in the door I had them drink a shot – tequila with Sangrita (not Sangria – SangrITA is a traditional spicy tomato-y fruity chaser for white tequila) The word “Sangrita” translates to “little blood”, so I thought making my friends drink tequila with a “little blood” to get warmed up was very apropos. the kitchen - where the action always is - notice 'Halloween' on the tv! As it turns out, the Vampyre Cat also had no skills when it came to carving a pumpkin. I set out to do a Veronica Lake style swirly bangs with one eye pumpkin, but it soon became apparent that I was going nowhere fast. My efforts were met with much ridicule from my dear friends. Not wanting to seem overly sensitive, I made fun of my own pumpkin as well. 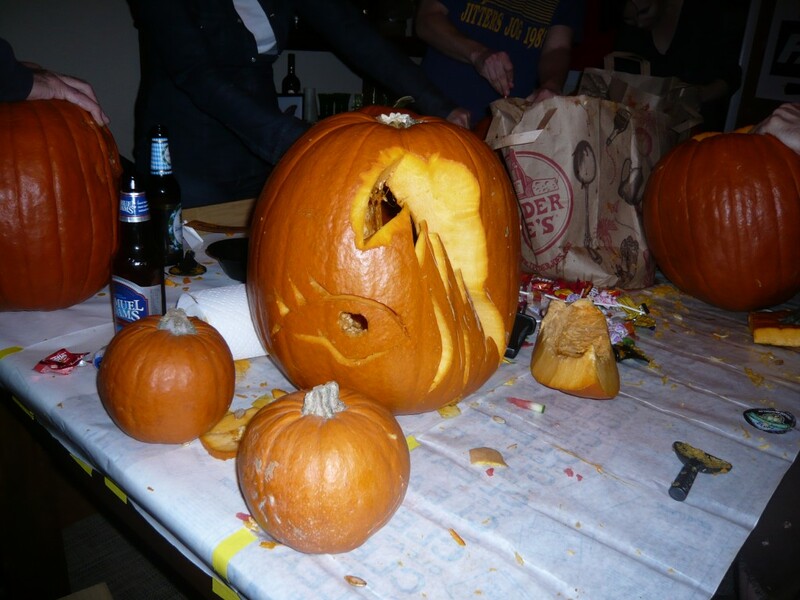 I feel badly … I didn’t stand behind my pumpkin. If I were on Project Runway, Heidi would have “Auf wiederzein” ‘d me. what the hell AM I trying to do here? 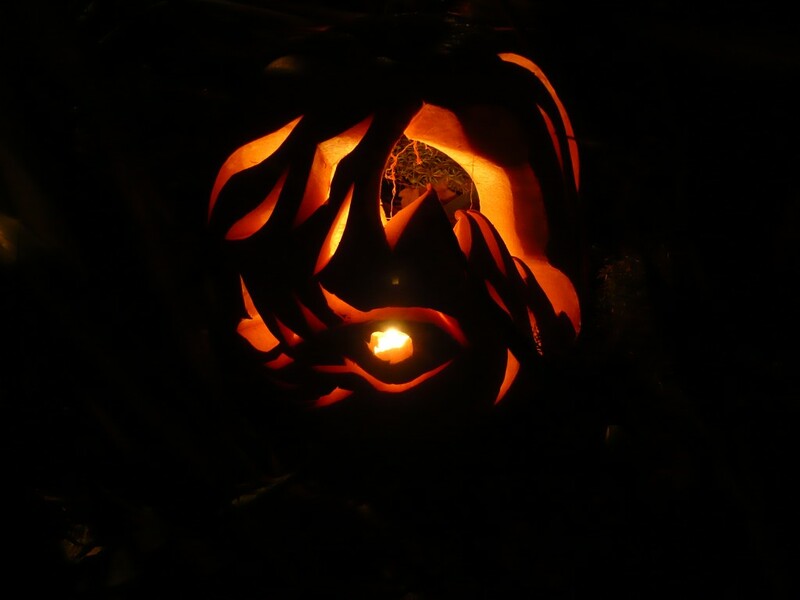 It turns out that I didn’t have to be embarrassed about my pumpkin – I realized that it was trying to be a fish swimming through seaweed. Once lit, it did just fine in the line-up and had no problem holding its own against some pretty heavy hitters! 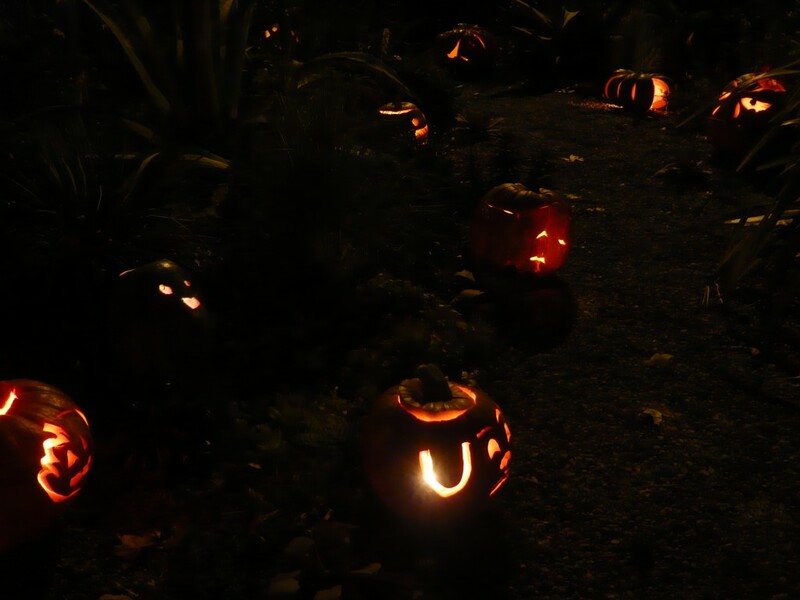 My friends carved some mighty impressive gourds – and one thing these images can’t capture is the wonderful smell of twenty-two pumpkins burning at once … warm, toasty and redolent of autumn. Euan carved a big pumpkin eating a tiny pumpkin - he always wins! the minion's pumpkin is shooting my pumpkin! 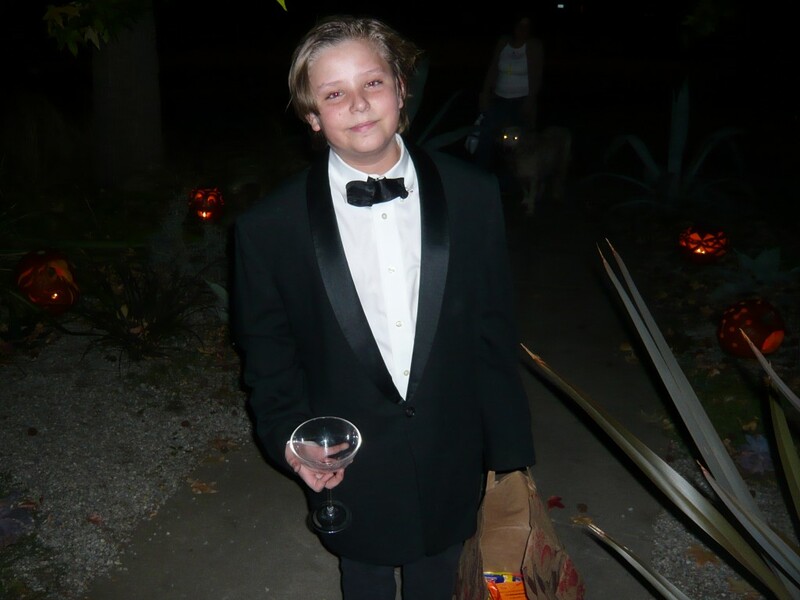 It was a BRILLIANT Halloween! Great post! What a good idea. I am going to keep this in mind for next year! This annual post always makes me wish I were a neighbor if not a guest at the party. BTW, I looove sticking my hands in pumpkin guts! Does that make me a freaky person? Oh, who cares. Happy holidays, Germi. Awww, what a top-notch party…! You put together all the elements for a deliciously fun & creative evening. Oh I wish I could have trick or treated YOUR house! Fabulous. Of course I would have foregone any candy for one of those Tequila shots with the blood chaser! Hi Janie! 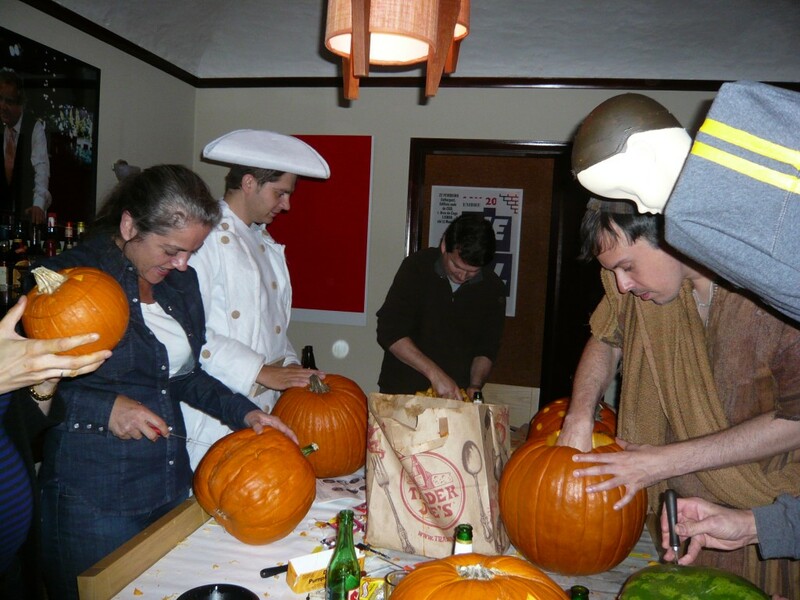 A Pumpkin Carving party is a GREAT way for adults to take a little bit of Halloween back for themselves! The kids can have supervised carving earlier, and then the adults can go wild – and the results are hauntingly beautiful. You should do it next year, definitely! I HIGHLY recommend tequila as a creative ‘booster’ to the carving! Try it next year! Dear Expat! I LOVE that you’ve been following the carvings over the years! 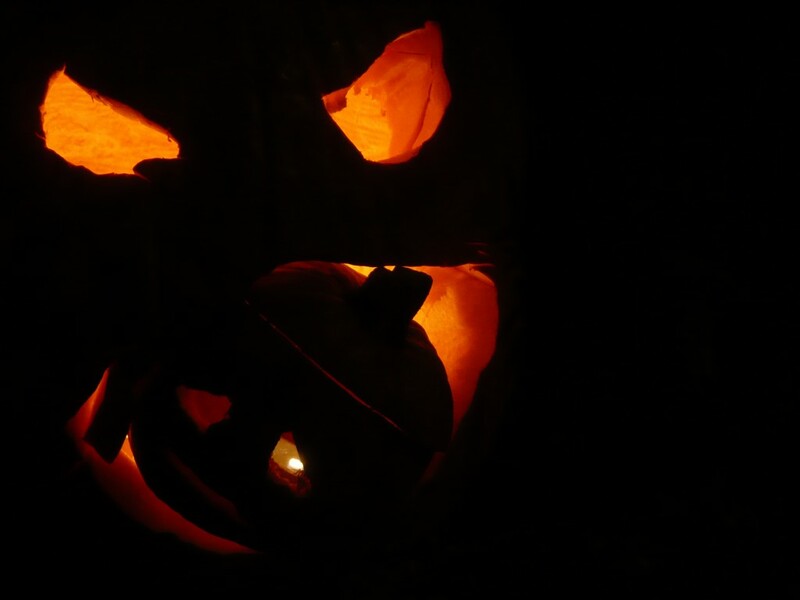 And anyone that likes pumpkin guts BELONGS at my carvings – we LOVE the freaky! The freakier the BETTER! XO! Loree my pal! Those shots were out of this world – definitely DANGEROUS and delicious … right up our alley! Sangrita was a great discovery for this aging goth! And when you come to my house you can have candy AND tequila/sangrita! Any day of the year! XO! 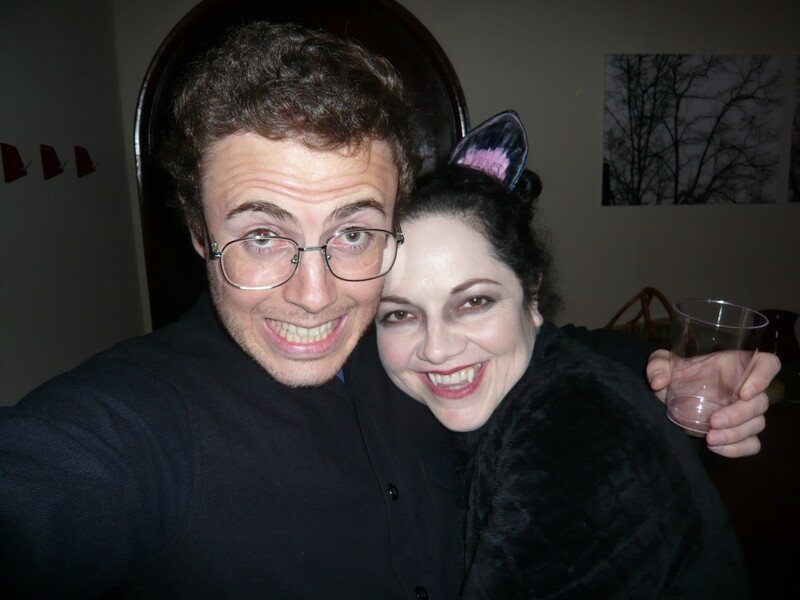 Looks like you had a fun vampyre cat night, I actually had a cat call Vampi once! The blood-”shot” entrance to your party was a great idea, I must remember this for next year! You cannot beat tequila then a bunch of knife brandishing, it just wouldn’t be Halloween! It looked like you had gnawed a large hole in the side of your pumpkin with you lispy sharp canines! But the effect lit up was actually really good! The dorky-lisp affliction was FUNNY, I always seem to end up with some part of my costume really irritating me as well, I could totally relate to your pain. I usually have on an itchy wig that causes a rash, a mask I can barely see through, a way-too-warm outfit which makes my make-up melt…that sort of thing. What a fun party! and What a fun pumpkin patch! I just may want to clone your party at my house next year. ESP! He who enjoys Halloween as much as I do! I enjoyed being a Vampyre cat – but I didn’t have a name! So next year (I decided I am going to refine my vampyre cat outfit until I actually purr) I will be Vampi the Vampyre Cat! I ended up falling in LOVE with my fangs! Everybody should have a pair! They looked really real, and I kind of got used to the lisp and by the end of the night I talked myself into thinking it made me sound like a Vampyre Cat from Madrid. So I suggest that you invest in a good pair of fangs for next year – and buy them NOW, to get that pesky lisp thing dealt with. Not EVERY ghoul can be from Madrid! Hi there Dee! I JUST had the last drop of Posole, and it was even BETTER! I wish I could have shared it with the entire garden blogworld – I’d have won MANY friends! Feel free Mary Beth! 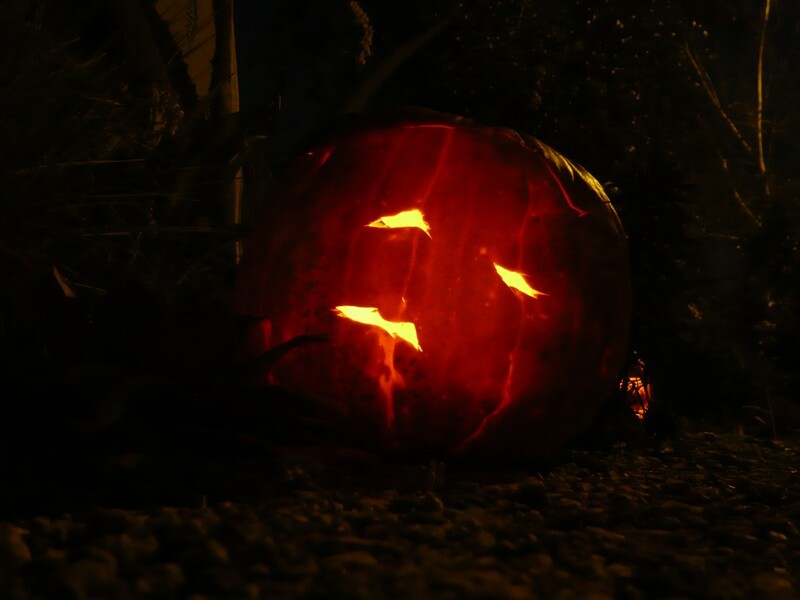 I’d love nothing more than to find out that there are late night pumpkin carvings popping up all over, with whimsical/scary/ strange/beautiful pumpkin gardens as the wonderful result. I’d be SO HAPPY! DO IT!!! What fun! I love the whole atmosphere, the lit pumpkins and I’m trying to imagine the smell. I’ve only ever seen all this in magazines(and comic books) . No Halloween in India. It looks a bit like our Diwali with all the fiery pumpkins (we settle for lamps) but a much more deliciously spooky time. 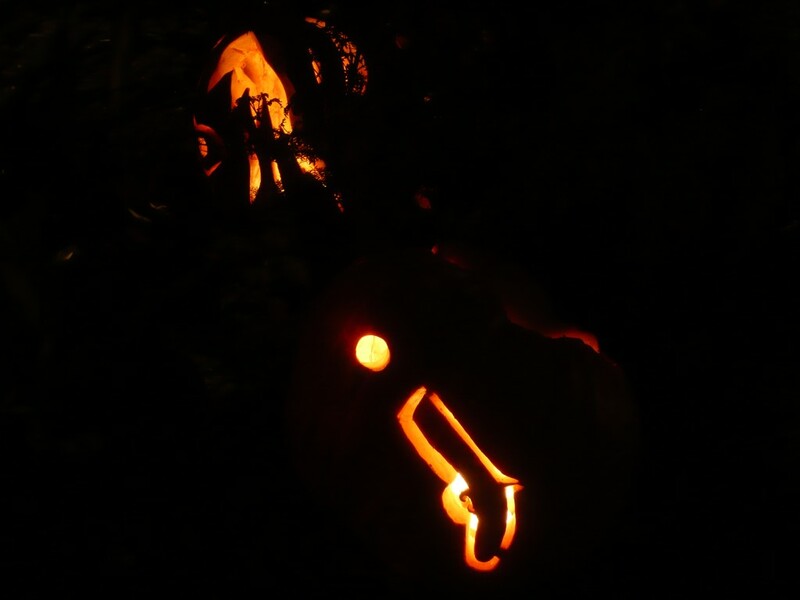 Can’t decide if I prefer the sophisticated, designery abstract underwater pumpkin, or the true-to-the-holiday spirit of the big pumpkin devouring his little friend. Nick goes so nuts here decorating, that when it’s time to carve the pumpkins, creative energy is running low, and we usually resort to a template. Hey, there’s an idea – the Germinatrix line of Abstract Jack-o-Lantern Templates! Sunita – Halloween is one of the only holidays we have where people are encouraged to go a little wild – not every city celebrates Mardis Gras (much to my dismay! ), which is VERY decadent. I embrace every opportunity to dress in costume, as well! I imagine Diwali is SO AMAZING from the images I’ve seen. INDIA! Wow … I just adore that we gardeners from all over the world have access to each other now! Hurray Internet! Thanks for visiting – imagine how much a round trip ticket to my LA garden would have cost! Hey Dollface (I mean YOU, Susan!)! I think you might have just given me my first gazillion-dollar idea! You are entitled to a percentage, of course! Germinatrix Pumpkin Templates!!! WOW – genius!!! And I can’t tell you how happy I am that my Underwater Pumpkin came even CLOSE to my pal Euan’s Pumpkin-Eating-Pumpkin motif. You should have seen it in real life – it was so perfect and funny! He has a real gift – I might have to partner with him on the templates. You totally HIT the MARK! What an IdeaWoman! XOXO!